If you love Asiago cheese, this is a great recipe to try! Asiago definitely has a very strong and distinctive flavor, and when melted into a creamy sauce for this Asiago Chicken Pasta, that flavor becomes more smooth yet you can still recognize it’s an Asiago cheese. 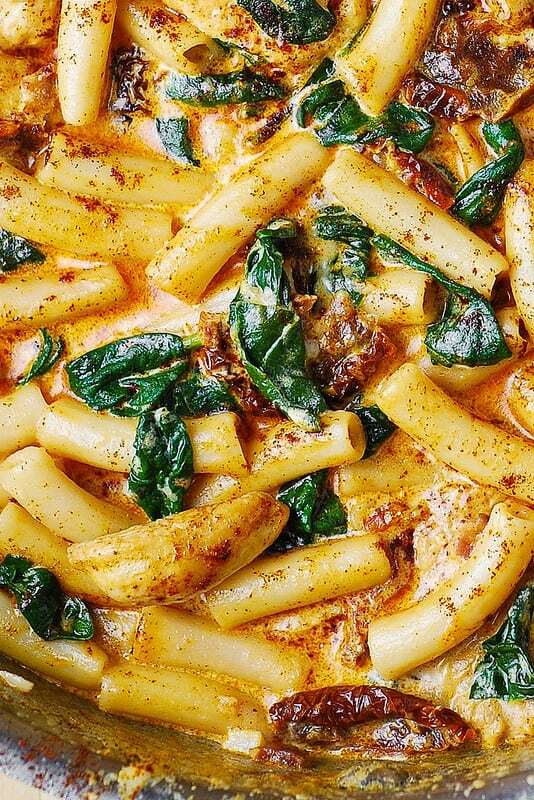 To me, using Asiago cheese in a pasta sauce is my favorite way to use it. And it is perfectly complemented by chicken sauteed with garlic, spinach, and sun-dried tomatoes! 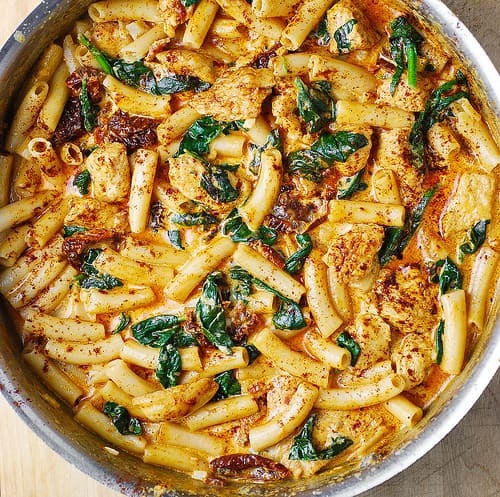 Short pasta, such as penne, is perfect for creamy pasta recipes like this one – Asiago cheese cream sauce perfectly coats every single pasta bite. Both pasta and chicken are literally drowning in the Asiago sauce deliciousness! 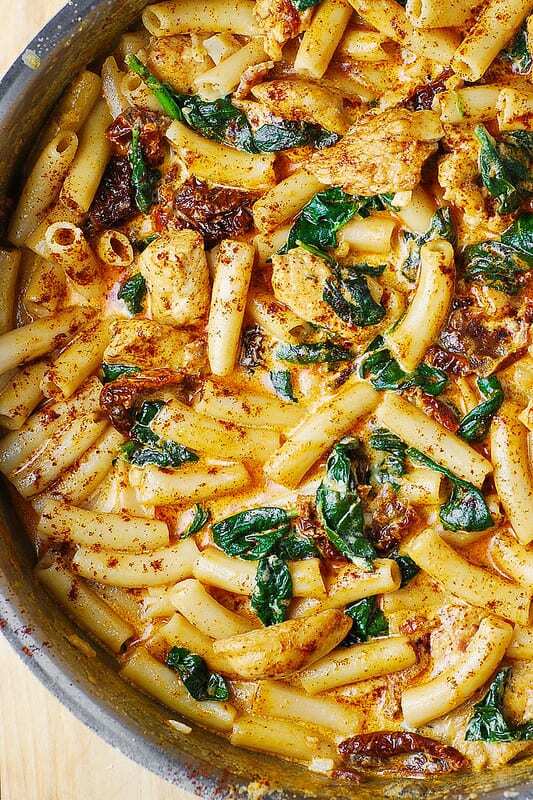 This recipe can easily be made gluten free by using gluten free brown rice penne. 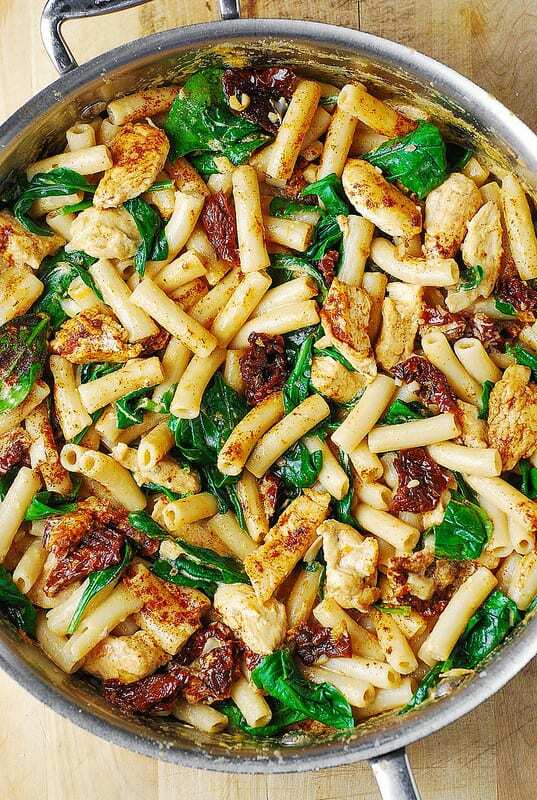 In this recipe, everything is smothered in a delicious Asiago cheese cream sauce: chicken sauteed with garlic, sun-dried tomatoes, and spinach. Cook pasta according to package instructions. Drain, rinse. Use sun-dried tomatoes in oil - if the sun-dried tomatoes are too big, chop them into smaller bites. Heat sun-dried tomatoes (cut them) in 2 tablespoons of olive oil and chopped garlic on medium heat. Add chopped chicken breast to the sun-dried tomatoes and oil - generously season the chicken in the skillet with salt and paprika. Cook chicken until it's cooked through completely. To the same skillet with chicken and sun-dried tomatoes, add 1 cup of half and half and 1/4 teaspoon salt - bring to boil. Add 1/2 cup of grated Asiago cheese (half of what the recipe calls for) and stir for about 30 seconds to melt the cheese. Reduce the heat from boil to medium and continue stirring to make sure all cheese melts. At this point, if the sauce is too thin, gradually add the remaining 1/2 of Asiago cheese on medium heat, constantly stirring all around the skillet. If the sauce gets too thick, add another 1/3 cup of half and half and stir. Taste the sauce - if 1/4 teaspoon salt was not enough, add more. Add cooked and drained pasta to the sauce. Add spinach, mix everything - cover with the lid and let the pasta sit to allow spinach to wilt, on low simmer. After spinach has wilted, stir everything together to combine, taste and add more salt, if needed. To substitute for 1 cup of half-and-half, do this: combine 1/2 cup of whole milk with 1/2 cup of heavy cream. GREAT DISH!! Tastes just like the one at milestones! Love this recipe…have made it several times served with garlic bread. So glad you liked this pasta dish! It tastes so good with garlic bread! Delicious! It’s our new family favorite. made this tonight and started with diced pancetta before sauteeing the sundried tomatoes. used a fine grate for the asiago and it was perfection no added salt-unnecessary with the pancetta. thank you for a great date night dinner! super easy and delish! Great idea to add pancetta – what a delicious addition to this pasta! Yes, you can make this a day in advance. Reheat it gently on the stove top or in the oven. Add extra milk to thin out the sauce. Only one word required “Fabulous”. Great flavor in this dish, we really enjoyed it. But I had a problem getting a good cheese sauce. The Asiago cheese just stuck to the chicken instead of making the half & half thicker. So I had more of a broth which tasted great but obviously didn’t cling to the pasta. Any suggestions? Make sure the pan and the liquids in the pan are really hot. Bring to a quick boil a couple of times, if you have to. Then, immediately reduce to simmer. And keep stirring to dissolve the lumps.